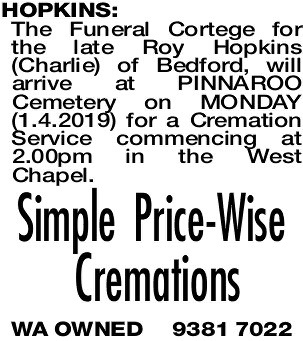 The Funeral Cortege for the late Roy Hopkins (Charlie) of Bedford, will arrive at PINNAROO Cemetery on MONDAY (1.4.2019) for a Cremation Service commencing at 2.00pm in the West Chapel. 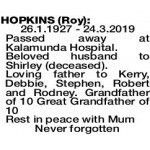 HOPKINS ROY 26.1.1927 - 24.3.2019 Passed away at Kalamunda Hospital. 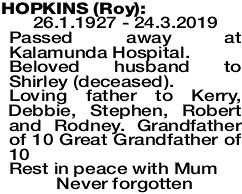 Beloved husband to Shirley (deceased).